Source: CICH graphic created using data adapted from the First Nations Regional Longitudinal Health Survey (RHS) 2008/10, National report on adults, youth and children living in First Nations Communities. https://fnigc.ca/sites/default/files/docs/first_nations_regional_health_survey_rhs_2008-10_-_national_report.pdf – accessed July 27, 2017. 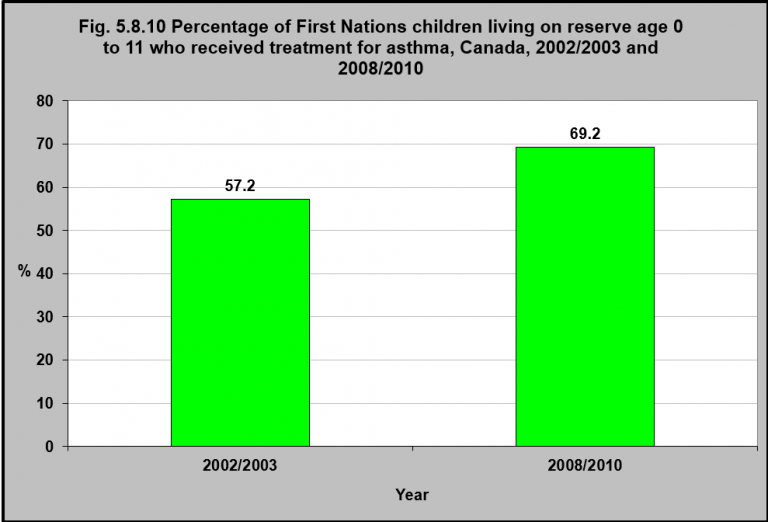 Between 2002/03 and 2008/10, the proportion of First Nations children age 0 to 11 living on reserve who received treatment for asthma increased from 57% to 69%. This was a 12% increase.